Sebastian Gorka delivered a fiery two-and-a-half hour (and reportedly classified) speech to students at the U.S. Army's Special Operations Center of Excellence a few weeks before he was ousted from the White House. Buzzfeed News first learned about the "secret" speech through documents obtained in response to a Freedom of Information Act request. What they're saying: An officer at the Aug. 9 speech characterized it as a "tirade" about the war in Afghanistan, Sharia law, radical Islamic terrorism, and the Trump administration's aggressive plans to "defeat it all." Another U.S. Army special operations officer described it as "classic Gorka." 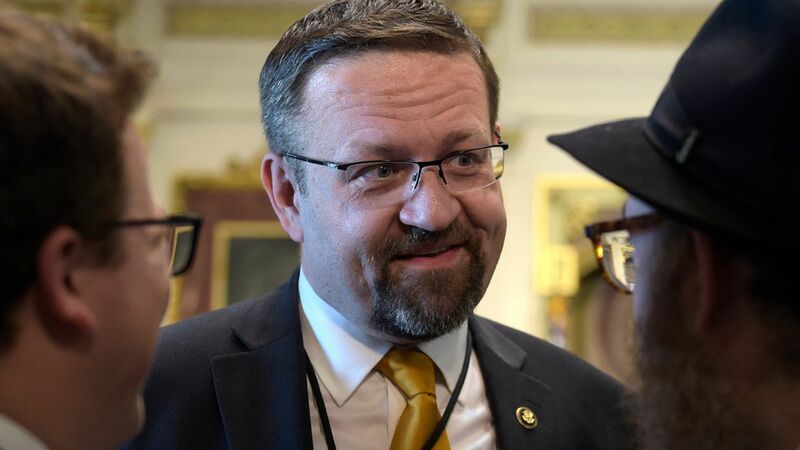 Gorka's PhD adviser recently told CNN that he "would not call Gorka an expert in terrorism," despite Gorka's website claiming he's an "internationally recognized authority on issues of national security, irregular warfare, terrorism and democratization." A spokesperson for the center declined to discuss details of the talk with Buzzfeed, and would only say that Gorka spoke about "extremism in religion." An important part: Two special operations officers told Buzzfeed that Chief of Staff John Kelly barred Gorka from speaking publicly while serving as deputy assistant to Trump. Not long after the classified talk, Gorka went on a vacation, during which Gorka's security clearance was revoked.